Trick riding into the New Year! 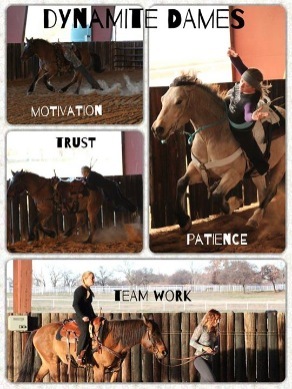 The girls have been hard at work this last year breaking in new horses, working on new tricks and adding shows for 2015. They are excited that 95% of their shows from 2014 re-booked them for 2015. The girls have grown so much as a team, as sisters, as friends and as family. The girls each bring their own unique talent to the team, and each talent seems to compliment the others. With their strong work ethics, faith and love for what they do they push on into the New Year more excited then ever. They are proudly ready to show the new things they have been working so hard on. They invite you to join them in 2015. We must start off with thanking everyone that made 2014 possible. God, our families, the stock contractors, and all of our fans that believed in us. Also our horses, without them we would not be where we are today. They give us 110% everytime they go out and perform, and in return we trust them with our hearts. From the bottom of our hearts, we thank you! We had an AMAZING 2014! We are so extremely blessed to be living a dream and sharing our passion with the world. In 2014 we traveled from Texas to California to New York and lots of places in between. We had amazing adventures which included white water rafting in California, going to Mount Rushmore when it was -20 and visiting Niagra Falls just to name a few. We met the most amazing people that accepted us and welcomed us as family. We started 3 new horses and succesfully integrated them into our shows. We feel like we accomplished A LOT this year. We grew as an act, as a team, and grew in the beauty of successful young women. We could not have asked for a better 2014 and are excited at all of the opportunites it has handed us. Almost every rodeo that we performed at asked us back, one even asked us back for a 3rd year. That is amazing in this business. Most contracts are every 2 years. We have already had meetings pertaining to some of our contracts for 2015 and are giddy with excitement to get on the road and get back to doing what we love. We are hoping to add a few more horses this year AND add to our act. We are even going to be busy enough to take on a few interns. We are looking forward to seeing all the people we met and became family with and are excited to meet new ones. Again, thank you!